The two countries exchanged views on scaling up the COEs which have been a main-stay of agricultural cooperation by bringing in advanced Israeli practices and technology, Modi added. New Delhi: Aiming to strengthen partnership in the farm sector, India and Israel today said they are working on a five-year plan for cooperation in agriculture and water. A three-year joint programme (2018-20) has already commenced, under which the Centres of Excellence (COEs) are being set up across the country to train farmers about Israeli farm and water technologies. As many as 28 such centres are being set up under the programme. One new centre at Bhuj, Gujarat, will be inaugurated by Prime Minister Narendra Modi and his counterpart Benjamin Netanyahu during his ongoing visit. They will also visit a centre in Vadrad in Gujarat. “We will strengthen the existing pillars of cooperation in areas that touch the lives of our peoples. These are agriculture, science and technology, and security,” Modi said after holding extensive discussions with Netanyahu to strengthen bilateral relations. The two countries exchanged views on scaling up the COEs which have been a main-stay of agricultural cooperation by bringing in advanced Israeli practices and technology, Modi added. Netanyahu shared idea of revolutionising Indian farm sector with use of Israeli water efficiency improving technology. “Some plants need more water, some less. We can see it today with big data, with drones, with other instruments of technology to make farmers produce much more crops. More crops with less,” he added. In a joint statement issued after the meeting, India and Israel announced that “both sides are working together on a Five Year Joint Work Plan for strategic cooperation in agriculture and water”. Both the Prime Ministers expressed satisfaction over the roll out of the three-year work programme (2018-20) in the field of agriculture aimed at increasing crop yield and optimisation of water use efficiency. According to the statement, the PMs were apprised of the progress made in jointly establishing 28 COEs across the country. They also underscored the importance of sharing the development experiences with other countries. 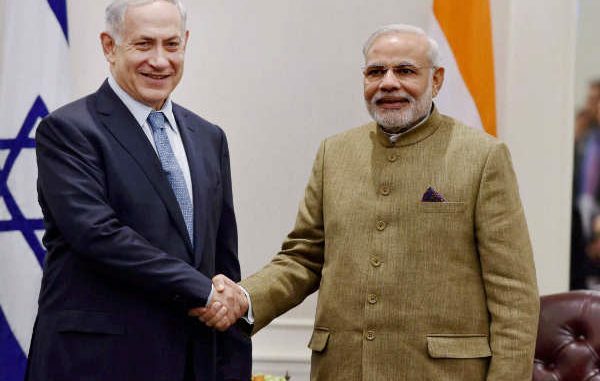 India and Israel have agreed on ways to develop joint programmes of assistance for third countries in the areas of training, capacity building, and the development of small projects in the agriculture, water, health-care and education sectors, the statement added.